Many customer experience (CX) leaders are beginning to question the obsession with NPS™, Overall Satisfaction, and other similar measures of overall CX performance. Why? 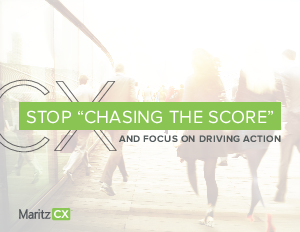 Experience has shown that these measures can entice organizations to spend their time “chasing the score,” which can actually undermine CX success. This eBook presents a benchmark study that has led to development of a robust CX maturity framework, that proves why NPS isn’t the only thing that matters. The CXEvolution Organization CX Maturity Model measures 14 specific CX competencies that separate CX companies from CX laggards. Learn how to measure, monitor, and reward CX efforts to create a successful CX program. It’s time to start focusing on creating positive customer experiences, instead of just focusing on the score.